The computer got some of safety reasons another two ventilators. There is need for these because of that only already, because the one with passive refrigeration is Zen with a power-supply unit already only-one an active heat exchanger does not move it the air in the inside of the machine. I cut out the lower aluminium of the case and setup a 12 centimetre - Silent Blade GT12252BDL-2 type mark - ventilator onto his place. Between the ventilator and the floorboard rubber a mat was found in the interest of the quieter function. 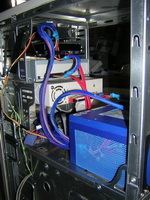 The other ventilator serves the refrigeration of the hard disk drive. 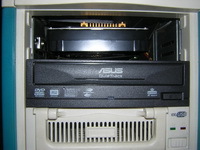 The hard disk a rubber onto swaddling the house supreme 5,25 inch ones rack I posted it on his place. I alleviated the sound of the hard disk significantly with this solution. I put a cooling flange in the interest of the more efficient heat submission onto his roof. That of this skim was found one 80 centimetre ones - Y.S. 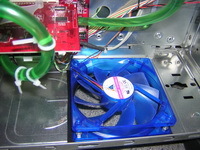 Tech FD128025LS-N - ventilator. 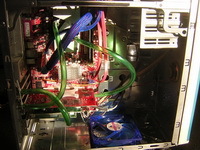 Both ventilators join onto the motherboard. A program controls their function. They are activated then temporarily only, the temperature of the hard disk drive attains a value defined by me concerned if the case is his inner temperature.